a waterproof sol silicate paint, optimised for concrete and formulated for protection against weathering, water and chlorides. KEIM Concretal W is a sol-silicate paint system with all of the benefits of a classic mineral paint, producing a lightfast, breathable and extremely durable mineral matt surface finish. 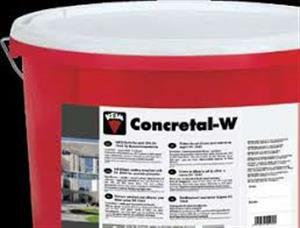 Manufactured from potassium silicate (waterglass), sol-silicate and natural earth oxides, KEIM Concretal W is inherently compatible with concrete substrates and forms a strong permanent bond between the paint and concrete.